Our mission is to help savvy snackers eat better and feel better, today and tomorrow, all with great taste from the ground up. The newest addition to our brand portfolio is SPOKES. 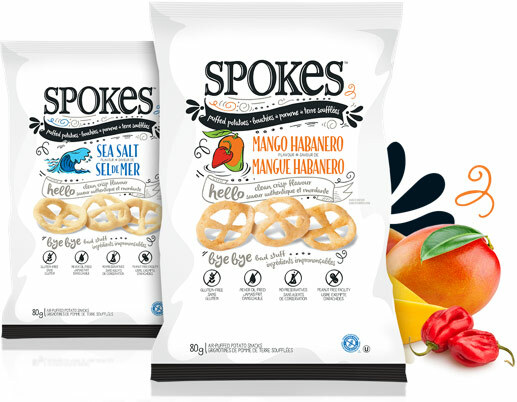 SPOKES are air-puffed potato snacks that are made with simple, natural, gluten-free, dairy-free, and non-GMO ingredients. We use a special hot-air puffing process to make these light and tasty snacks with only 40 calories per cup. The only oil used in the process is a gentle mist of sunflower oil so that our great-tasting seasonings stick. Always air-puffed, never fried, Spokes are available in 9 great flavours. Visit spokes.ca to learn more. © 2016 Left Field Foods, All Rights Reserved.